Breaking Out of My Cage, by Kate P.
I’ve thought a lot about why I needed to do this photo shoot. The campaign itself was a no brainer. It’s beautiful and it’s important. And I am a firm believer in the power of connecting visually with people and that by seeing what “you hate” or “don’t understand” “you”, whoever “you” are ,will come to understand better and fear less which in the end means less hate in the world. It was also important to me because, as I have often joked, I am the token straight girl in my coven. I was at my coven-sister’s wedding to a lovely woman. They are in love, they are married, they are just like any other couple. But because of a law, ignorance and fear, they are considered different and wrong. That is not okay. So standing up for them and all my family and friends was an easy choice to make. Stepping into a room with 200+ people when I have a chronic illness where my body is allergic to half the planet and simple things like perfume and scented laundry soap can send me to the hospital? That was not so easy a choice to make. Since being diagnosed with Multiple Chemical Sensitivity (MCS) in 2007, my life has been lived inside a bubble. I went from being a natural extrovert to an enforced introvert. I have to be very careful about what comes into my house and when people come over they have to be careful what they wear/bring with them. I can’t ride public transportation, most stores are deadly and malls are out of the question, going out to dinner is a hit or miss proposition and going to a play or concert is next to impossible. All because my body cannot handle what most people live with day in and day out. It’s like living in a cage, an apt metaphor since those of us with MCS are called Canaries in the Coal mines. We are the world’s advanced warning system for toxins. Five years of living like a hermit is a long time for a social butterfly. I was going a little nuts. And frankly I was tired of living in fear and thereby not living. 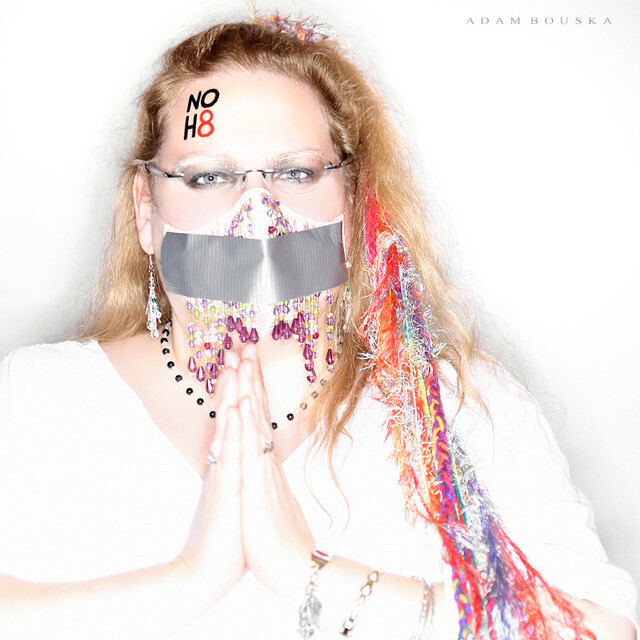 The NOH8 photo shoot seemed like the ideal way for me to try to spread my wings and push at the walls of my cage. We got there pretty close to start time because the RSVPs on Face Book had gotten up to like 400 people. I took that to mean get there early. In hind sight, later might actually have been better for me, but ah well. The line for registration wound down three narrow hallways of the hotel and reeked of chemical scents from the 200+ people already there. The hubs gave me a choice: wait in line or get my picture taken. I was not going to be able to both. I choose to wait in the car. Close to an hour later I met him at registration and signed in and got my tatoo. Then it was time to wait. This could have killed the whole thing. We were in a room with those 200 people who’d been standing in line for registration, but we found a corner out of the way and next to an air vent. They had a DJ playing loud dance music and everyone was mingling. It was fun. For me it was the first time I had been in that kind of party environment since being diagnosed. We ended up waiting about two hours. Toward the end of our wait, the hubby asked me if I wanted to go outside for a bit. I knew by then that if I left I wouldn’t come back. I was pushing. I’d had to use my inhaler and take a bunch of antihistamines to hold everything together. But I *was* holding it together and I really wanted to do the photo. Finally it was my turn. Getting my photo taken was awesome. There is nothing quite like working with a professional photographer. And Adam is SO that! He knew exactly what he wanted as soon as I stepped in front of the camera. He had me shifting into several different positions simply and easily. I could just tell that he could “see” the image as he was shooting. It was very cool. The hubby took a couple of pictures as Adam was working, so we had a clue of what was going on, but the final shot! Damn! I’d seen a bunch of people pose for their own homemade NOH8 photos’ after their official ones, but I simply couldn’t. The duct tape was toxic to me and the few minutes I had it over my mask was enough to kick my system over those final few inches to “MUST fall down now.” The hubs steered me out of the room and then out of the hotel as fast as he could. I went into “trail pony” mode pretty much instantaneously. I had a sweatshirt in the car to cover the t-shirt that was covered in toxins that I picked up by being in the environment. I took my meds and drank lots of water. We had planned to get food but my stomach was rebelling, so the hubs drove directly home instead. I was pretty much a brainless zombie all the way and don’t remember much for the next several hours, which is par for the course with an exposure like that. It took a couple of days to fully get over the toxins, but over all it wasn’t bad all things considered. It's interesting looking at the finished photograph; I love it. I’ve gotten so many compliments on it already. But it's different than what I expected. I went into the shoot thinking that the tape over my mask would symbolize not just the silencing of voices for marriage equality, but my voice because of my illness. I had been prepared to apologize for my appropriation of the photo shoot for my personal goal. Looking at it now, all I see is power and strength. I don’t see silence. I see me succeeding in being part of the larger campaign and succeeding in being *me*, in being vibrant and alive in a way I haven’t been since before I was diagnosed. I thought I was going into this shoot to stand up for something, and I did that. Turns out I also got something in return – more of myself. And I learned that I can push at the walls of my cage, even if that means getting sick, especially if the risk is worth the reward. Thank you Adam and Jeff and everyone at NOH8.